Aluminum “ornamental” fence is a more affordable and low-maintenance alternative to wrought iron, and is growing rapidly in popularity. 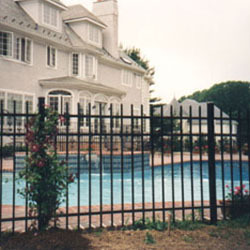 These fences don’t rust, which makes them perfect for pool enclosures. They never need to be repainted, and we guarantee that the finish will never peel or flake. COLOR: All the below styles are available in black, white, bronze, and sandstone colors. GRADE: Available in four grades, from residential grade (suitable for homes and private pool fences) to industrial grade (designed for commercial and municipal properties). With its classis smooth rail top & traditional spear points below, the Essex is designed to please aesthetically. A classic design with a smooth rail top. The Horizon has a classic design, smooth rail on top & picket spacing of 1 1/2″ between pickets. It is built for harmony in the landscape. With every other picket thrusting a spear point through the top rail and with 1 ½’’ spacing, this fence was created to heighten the beauty of your landscape. The Derby fence is ideal for pool applications and is also excellent for balconies and decks.